Daily deals is a very popular feature of the e-commerce sites. Daily deals are like running discounts in short time is one of the best ways to attract more customers to your site. 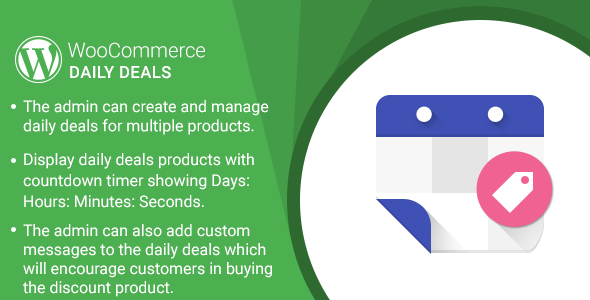 WordPress WooCommerce Daily Deals plugin helps the admin to create day-to-day deals for single or multiple products on their websites easily and quickly. The admin can configure the deal start and end date, deal price, and deal name. The customers can see the daily deals products with sale tag, deal price, and countdown timer. The admin can also add custom messages which will encourage customers in buying the discount product. The admin can configure the daily deals custom message.